Editor’s Note: Check back at ClarkCountyToday.com later this week to read more on our full interview with Congresswoman Jaime Herrera Beutler, including discussion on Oregon’s plans for tolling, the state of the economy, her decision not to join a Republican-led effort to repeal Obamacare last year and more. VANCOUVER — The line snaked through the parking lot of Warehouse 23 in Vancouver, growing increasingly larger with the arrival of each new job-seeker. It was a time when “hope” had become the mantra for an entire political party, and indeed many arrived to U.S. Rep. Jaime Herrera Beutler’s first Jobs Fair desiring or expecting to find meaningful employment even as the jobless rate continued to spike across the recession-stricken nation. On Tuesday morning, the scene at Warehouse 23 along the banks of the Columbia River just west of Interstate 5 was completely different. It wasn’t the absence of hope that rendered the eighth rendition of the congresswoman’s Jobs Fair unrecognizable. Rather, at a time when the nation’s unemployment rate is at an 18-year low and the economy continues to grow at a brisk pace, it was the absence of desperation. There were no lines at Warehouse 23 on Tuesday. 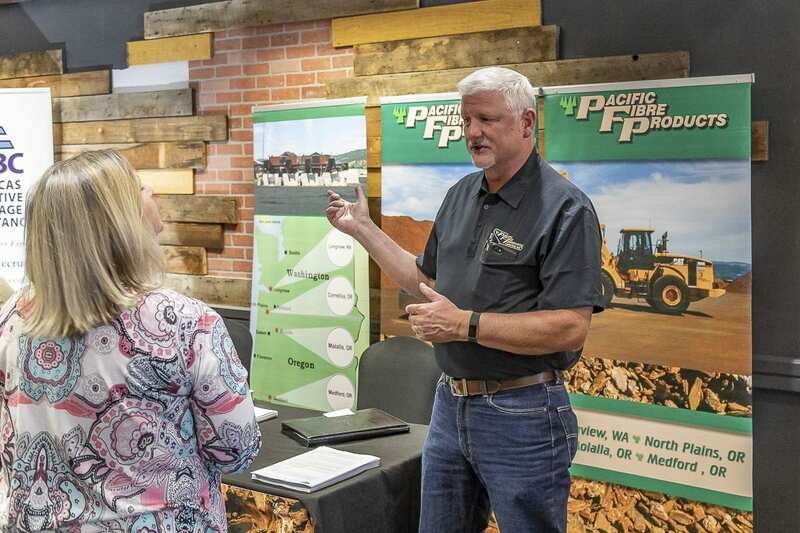 Instead, a steady trickle of would-be new employees trickled through the doors and explored the options presented in the form of about 40 businesses looking to add staff. The options were diverse, ranging from aerospace behemoth Boeing to smaller enterprises such as Hildebrand Concrete Construction, a Washougal-based business that has been powered by three generations of its namesake family. Paul Hildebrand, an estimator for the company, echoed the sentiments of others in attendance while agreeing that the current job market is one that favors the job-seeker over the employer as options grow more diverse and lucrative at the same pace as the economy. At Hildebrand Concrete Construction, the work happens to be difficult and laborious, meaning that wages and benefits are a big part of not just landing a good employee, but keeping them in place for a significant period of time. “We have very hard work that we do … It’s hard to get people that will consistently come,” Hildebrand said. Across the room, Pacific Fibre Products Vice President of Corporate Relations and Human Resources James Bobst pulled from a different passage of that same occupational sermon. He remembers well the time when lines of people turned out in desperate pursuit of the same job. These days, roles have been reversed. While companies like Pacific Fibre Products aren’t necessarily desperate, they are finding it more difficult to remain fully staffed up with qualified and driven individuals. “Now we have to sell ourselves to the candidates,” he said cheerfully after providing materials to a Jobs Fair attendee. For Pacific Fibre Products and its subsidiary Lemmons Trucking, that means treating employees well through wages, benefits and an atmosphere that creates in employees a desire to remain with the company. Bobst, for example, has been with the business for 27 years. He said the company has about 25 employees, as a conservative estimate, who have been with the business for three decades or more. The most senior employee has been there for 41 years, he said. That longevity is a result of how employees are treated, he surmised. “It’s very easy for us most of the time to find good employees,” he said. Other companies in attendance Tuesday aren’t necessarily known for their great wages and benefits. Enterprises such as Walmart offer meaningful employment to many, but not of the sort that regularly leads to longtime employment or explosive wage growth, an attendee who had walked past the booth noted. 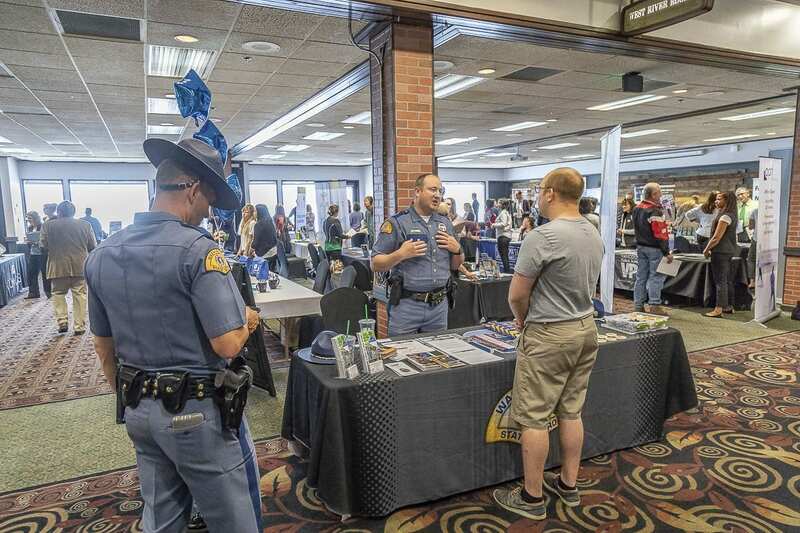 Still, attendees of the Job Fair spent time evaluating all options, which included career paths in law enforcement, a field that is perhaps more challenging from a recruitment perspective. Trooper Chris Bendiksen of the Washington State Patrol noted that the agency could easily fill 60 positions immediately if there were qualified applicants. There are opportunities with the state patrol ranging from landscapers and dispatchers to troopers and forensic scientists, but barriers prevent immediate filling of many positions, Bendiksen said. He said high standards in regards to physical health and aptitude in addition to an individual’s history of using illicit substances could all disqualify them from employment. “We see a lot of folks not understanding the marijuana issue,” Bendiksen said, adding that just because it’s legal in Washington doesn’t mean it’s permissible for an officer of the law. Competition from cities and counties that offer better pay and benefits can also play a role, and that’s a microcosm in a broader picture in which employers are increasingly competing with one another for the services of good employees. Unsurprisingly, Herrera Beutler gives much of the credit for the booming economy to President Donald Trump and the conservative hold on power in Washington, D.C., that has been in full effect for going on two years. She again thinks back to eight years ago and compares the path taken by President Barack Obama to that of his Republican predecessor. She said for the last several years of his presidency, he was reluctant to sign any meaningful legislation, but specifically neglected the economy. She lists the “Cash for Clunkers” program, massive stimulus programs, millions of taxpayer dollars paid to the now-defunct solar company Solyndra and even the Affordable Care Act, also known as Obamacare, as examples of what she considered to be a flawed approach to fiscal policy. Up until the election of Trump, she said the U.S. economy had essentially stalled out, even if it had been snatched from what had been a freefall. In addition to a policy of removing two federal regulations for every one new regulation, Herrera Beutler points to the passage of the Tax Cuts and Jobs Act, 2017 legislation seen as a crown jewel in the early legacy of Trump and the Republican-held Congress. 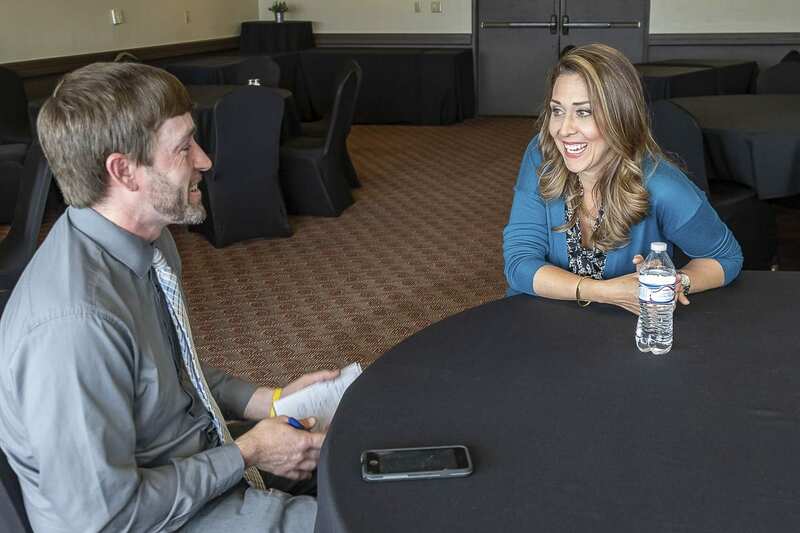 Herrera Beutler again returned to the jolting and obvious differences between her first job fair eight years ago and the less desperate affair that unfolded on Tuesday. As a rookie congresswoman, she remembers walking up and down the line that led to the job fair and hearing sad stories from dejected 3rd Congressional District residents who were in many cases putting aside their pride in pursuit of a paycheck.